Biologically speaking, beans are legumes, meaning they are the seed or fruit of a pod. But beyond the bean's official status, humans tend to use them in one of two ways -- as a vegetable or as a protein. How you classify them in your diet is primarily a matter of where you get your protein. Dried beans are a particularly rich source of fiber, and 1/2 cup of cooked dry beans offers 8 grams of protein, according to the Agricultural Research Service at the U.S. Department of Agriculture. The Academy of Nutrition and Dietetics notes that you can count beans as either vegetables or proteins. If you eat meat, fish and poultry, then beans can be treated as a vegetable, with 1/2 cup of cooked beans equaling one serving. If you are vegetarian or vegan, however, beans are an important source of protein that should be counted in the same group as quinoa, soy or, if you are a pescatarian, fish. For protein calculations, 1/4 cup of beans is the equivalent of 1 ounce of another protein food. 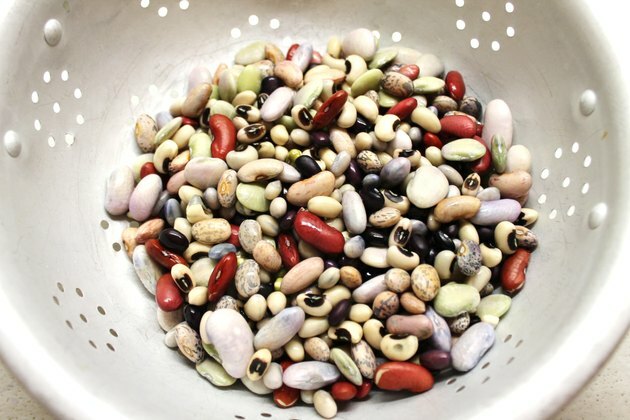 Academy of Nutrition and Dietetics: Do Beans Count in Two Food Groups – The Vegetable Group and Meat and Beans Group in MyPyramid? Are Nuts a Fruit or a Vegetable?